Breaking news of interest to...everybody who loves music! Austin, TX—JANUARY 30, 2015—Austin City Limits (ACL) is proud to announce the newest class of Austin City Limits Hall of Fame inductees with five legendary artists being honored: Western swing institution Asleep at the Wheel, country trailblazer Loretta Lynn, songwriting legend Guy Clark, master Tex-Mex accordionist Flaco Jiménez and Texas troubadour Townes Van Zandt. The announcement was made yesterday evening by ACL Executive Producer Terry Lickona at Austin's Rattle Inn. The 2015 ACL Hall of Fame inductees will be celebrated at a ceremony highlighted by all-star music performances to be held in June at ACL's studio home, Austin’s ACL Live at The Moody Theater. The event will be open to the public and ticket onsale information will be announced at a later date. The newest class of inductees features artists who have all graced the ACL stage multiple times, setting the standard for excellence and contributing to four decades of incredible performances. This year's class also recognizes in the non-performer category the original ACL crew, who played an important role in the launch and continuing success of the influential series and some of whom are still part of the crew today. New episodes of ACL are currently airing as part of the series’ milestone Season 40, with upcoming premieres featuring The Black Keys (Jan. 31) and Foo Fighters (Feb. 7). Foo Fighters recently immortalized ACL in an episode of their HBO series Sonic Highways, even recording a song, “What Did I Do?/God As My Witness,” in ACL's historic Studio 6A. ACL closes out this triumphant season with a special installment premiering Feb. 14, featuring inductions and performance highlights from the first-ever Austin City Limits Hall of Fame presentation. The Austin City Limits Hall of Fame was established in 2014 in conjunction with the iconic television series' 40th Anniversary to celebrate the legacy of legendary artists and key individuals who have been instrumental in the landmark series remarkable 40 years as an American music institution. The invitation-only inaugural induction ceremony took place April 26, 2014 at ACL’s original Studio 6A. Hosted by Oscar-winning actor and Texas native Matthew McConaughey, the historic evening honored the first class of inductees, featuring American music icon Willie Nelson who starred on the original ACL pilot program, Austin blues rock giants Stevie Ray Vaughan & Double Trouble and legendary steel guitarist and Grammy Award-winning music producer Lloyd Maines, in addition to non-performers who played a key role in the evolution of the program: original show creator Bill Arhos and longtime ACL supporter, Texas Longhorns football head coach Darrell Royal. A star-studded line-up paid tribute with incredible music performances, including: Lyle Lovett, Emmylou Harris, Buddy Guy, Robert Randolph, Doyle Bramhall IIand Kenny Wayne Shepherd. Based in Austin, TX, Asleep at the Wheel formed in Paw Paw, West Virginia in 1970. Since their inception, the venerable Texas swing band lead by founder Ray Benson has won nine GRAMMY awards, released more than 20 studio albums and charted more than 20 singles on the Billboard country charts. In 1972, the band signed their first record deal after Van Morrison mentioned they “play great country music” in an interview in Rolling Stone. They have appeared on Austin City Limits ten times, including the program’s first official episode in 1976 along with The Texas Playboys. Asleep at the Wheel’s star-studded upcoming release Still the King: Celebrating the Music of Bob Wills and His Texas Playboys features guest appearances by ACL veterans Willie Nelson, Lyle Lovett, The Avett Brothers, George Strait, Kat Edmonson and Merle Haggard. San Antonio, TX born Tex-Mex conjunto musician Flaco Jiménez has enjoyed a career that has spanned more than six decades, throughout which, he has collaborated with artists such as Willie Nelson, the Texas Tornados, Bob Dylan, Ry Cooder, Doug Sahm, and The Rolling Stones. Jiménez is a five-time ACL guest, first appearing in the program’s debut season. A five-time GRAMMY winner who is also a 2015 recipient of a GRAMMY Lifetime Achievement Award, Jiménez maintains a huge influence on the Tex-Mex genre by continuing to record and tour, as he upholds his status as the definitive Tex-Mex accordionist. 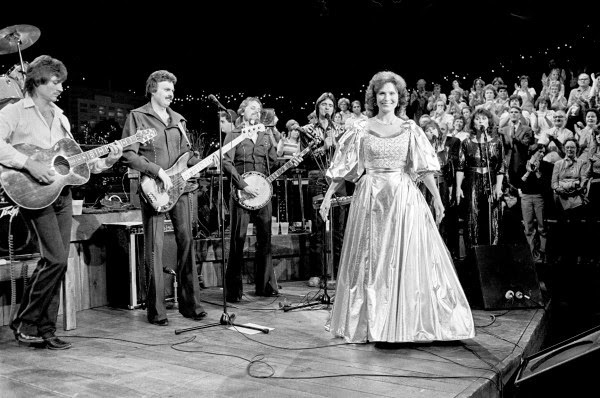 An American music treasure with a storied career, Loretta Lynn is a living legend with over seventy chart hits, a Presidential Medal of Freedom, a GRAMMY Lifetime Achievement Award and a Kennedy Center Honor. She appeared on two classic episodes of ACL in 1983 and 1998. As her most famous song says, she is a proud Kentucky-born coal miner’s daughter, who went on to become one of the most influential women in the history of American music. A West Texas native, Guy Clark has built a career of writing starkly honest story-songs. He's one of the finest living songwriters in American folk music, holding up the legacy of his late friend Townes Van Zandt. NPR raves “If you want to learn how to write a song — one that's built to last, with vivid characters and images that plant you squarely inside a scene — listen to Guy Clark.” Bob Dylan counts Clark among his handful of favorite songwriters. His first album Old No. 1 came out in 1975 and the revered songwriter has made seven stunning appearances on ACL. ACL offers viewers unparalleled access to featured acts in an intimate setting that provides a platform for artists to deliver inspired, memorable, full-length performances. The program is taped live before a concert audience from The Moody Theater in downtown Austin. ACL is the longest-running music series in American television history and remains the only TV series to ever be awarded the National Medal of Arts. Since its inception, the groundbreaking music series has become an institution that's helped secure Austin's reputation as the Live Music Capital of the World. The historic KLRU Studio 6A, home to 36 years of ACL concerts, has been designated an official Rock & Roll Hall of Fame Landmark. In 2011, ACL moved to the new venue ACL Live at The Moody Theater in downtown Austin. ACL received a rare institutional Peabody Award for excellence and outstanding achievement in 2012. 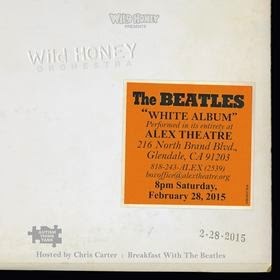 LOS ANGELES, Calif. — Benefit-concert producers the Wild Honey Foundation will present the classic Beatles self-titled album, better known as The White Album, performed in its entirety and in order by a star-studded house band and guest singers. The event, which will benefit the Autism Think Tank, will take place Saturday, February 28, 2015 at 8 p.m., at the historic Alex Theatre, 216 N. Brand Blvd. in downtown Glendale, Calif.
Current members of the Wild Honey Orchestra include a who’s who of respected L.A. recording artists: musical director Rob Laufer, guitar, vocals; Jim Laspesa (Dave Davies/Susanna Hoffs), drums; Derrick Anderson (The Bangles), bass; Rusty Squeezebox (Baby Lemonade, Love), guitar; Willie Aron, keyboards, vocals; Jordan Summers, keyboards; Darian Sahanaja (Wondermints, Brian Wilson Band), keyboards/vocals, Damon Fox (Big Elf), keyboards, Nelson Bragg (Brian Wilson Band), percussion, vocals; multi-instrumentalist Probyn Gregory (Brian Wilson Band); Sarah Kramer, horns; and Kaitlin Wolfberg, strings. Guest performers include: Dave Gregory (XTC), Vicki & Debbi Peterson (The Bangles), Chris Collingwood (Fountains of Wayne), Mitch Easter (Let’s Active), Susan Cowsill, John Cowsill, Alain Johannes (Eleven, Queens of the Stone Age), Dream Weaver Gary Wright (Spooky Tooth), Iain Matthews (Fairport Convention, Matthews’ Southern Comfort), The Muffs, Paisley Underground legendsThe Three O'Clock, Christine Collister (Richard Thompson band), Cindy Lee Berry Hill, Steven McDonald (Redd Kross) stellar 1960s sideman Keith Allison (Paul Revere & the Raiders), Cosmo Topper (Just Imagine Show), Anna Warnakor & Rachel Haden (That Dog), Nick Guzman, Thomas Walsh (Pugwash), Skylar Gudasz, Brett Harris, Django Haskins (The Old Ceremony), Lyle Workman(Todd Rundgren, etc. ), Dirk Hamilton, John Wicks (The Records), John Easdale (Dramarama), Steve Stanley (The Now People), Translator, Morty Coyle (All Day Sucker), and the always-possible Very Special Guests. As with last year’s sold-out Revolver/Abbey Road show at the Big Star Third shows at the Wilshire Ebell Theatre, this event will benefit the Autism Think Tank. The non-profit organization brings together a team of top autism specialists, via an Internet medical conference, to tackle the seemingly intractable and painful medical/psychological problems faced by kids like Wild Honey co-organizer Paul Rock’s ten-year-old son Jake, whose own issues have improved since his involvement with the group. Dating back to 1994, the 501(3)(c), non-profit Wild Honey’s numerous grassroots benefit/tribute events have featured appearances by Brian Wilson, Dave Davies from the Kinks, the late Alex Chilton, the Bangles, Al Stewart, Denny Laine, Danny Hutton from Three Dog Night, Chuck Negron, Matthew Sweet, Colin Hay, Dan Wilson, P.F. Sloan, John Brion, Peter Case, The Plimsouls, Victoria Williams, The Williams Brothers, Dave Alvin, The Blue Shadows, Aimee Mann, Michael Penn, Scott Miller from the Loud Family, Ann Magnuson, and so many more. The shows have been produced at various Los Angeles-area locations including the Morgan-Wixson Theater in Santa Monica, the Roxy, the Knitting Factory (Hollywood) and the El Rey Theatre. Over the years, Wild Honey shows have raised funds and awareness for the Sweet Relief Musicians Fund, Habitat for Humanity, the Liberty Hill Foundation, USC Norris Cancer Center, and the Coalition to End Gun Violence while paying tribute to musical idols: Brian Wilson, The Kinks, Big Star, The Byrds, The Everly Brothers, The Hollies, Harry Nilsson, Pete Townshend, solo Paul McCartney, and Elvis Costello. 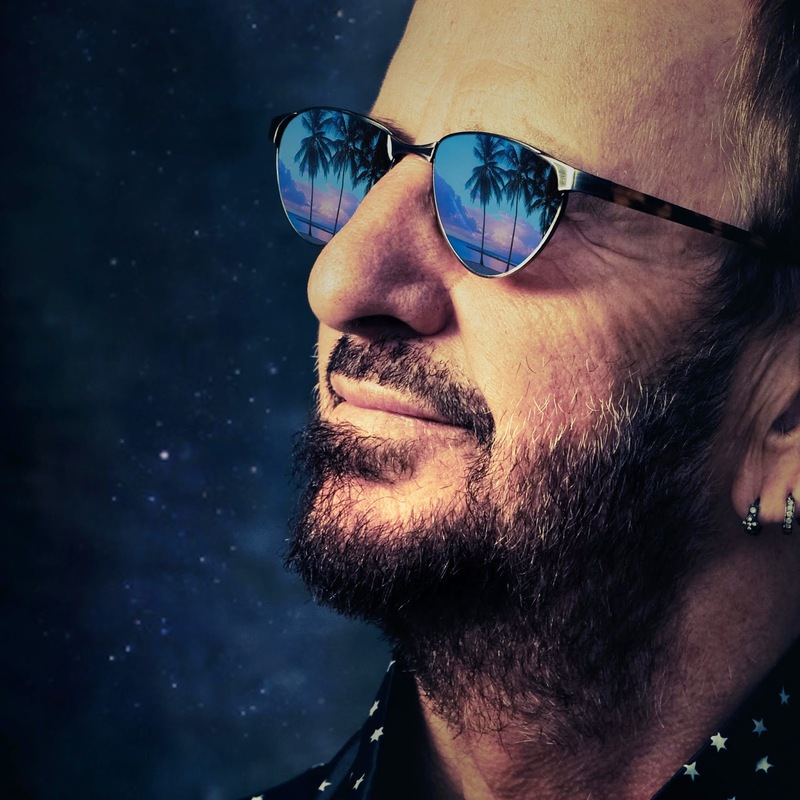 Los Angeles – January 29, 2015 - Universal Music Enterprises proudly announces Ringo Starr's 18th studio release, POSTCARDS FROM PARADISE. With 11 original tracks, the solo album is due out March 31, 2015 and is the first to include a song written and recorded by Ringo Starr and his current All Starr Band - Steve Lukather, Todd Rundgren, Gregg Rolie, Richard Page, Warren Ham and Gregg Bissonette. POSTCARDS FROM PARADISE was produced by Ringo and recorded at his home studio in Los Angeles and, as always, features friends and family. As Ringo often says, "If I am recording and you're in town and drop by, you're going to be on the record!" The album’s guest artists include: Joe Walsh, Benmont Tench, Dave Stewart, Ann Marie Simpson, Richard Marx, Amy Keys, Peter Frampton, Nathan East, and Glen Ballard (among others, complete details and track by track to follow in coming weeks). POSTCARDS FROM PARADISE will be released just after Ringo returns from the road with the All Starrs, who go back out on the road on February 13th with dates in the U.S. and Latin America (see link to tour press release below). Exciting breaking news of interest to fans of Brian Wilson, as well as lovers of the great duo She & Him, country singer-songwriter Kacey Musgraves and other modern-day sonic heroes. I love the album title too! Hollywood, California - January 29, 2015- He is one of popular music's most deeply revered figures, a legendary writer, producer, arranger and performer of some of the most cherished music in pop music history. Indeed, it is no exaggeration to call Brian Wilson one of the most gifted and influential composers of the past 50 years. For the release of his 11th solo studio album, titled No Pier Pressure, Wilson has returned to Capitol Records, his original label home with The Beach Boys. The album will be released April 7 in standard 13-track and deluxe 16-track editions, each available on CD and digitally, as well as a 16-track 2LP edition on 180-gram vinyl. For the No Pier Pressure sessions, Brian Wilson reunited with longtime collaborator Joe Thomas, with whom he co-produced The Beach Boys' No. 3 Billboard album That's Why God Made The Radio for the iconic band's 50th anniversary reunion in 2012. In addition, Wilson was joined at Hollywood's Ocean Way Studios by talented musicians he personally invited to record with him, including his former Beach Boys bandmates Al Jardine, David Marks and Blondie Chaplin, as well as Kacey Musgraves, fun. 's Nate Ruess, She & Him's Zooey Deschanel and M. Ward, Peter Hollens, Capital Cities' Sebu Simonian, and trumpet master Mark Isham. Wilson has also brought in session all-stars Don Was, drummer Jim Keltner, Dean Parks, and Kenny Aronoff. Members of Wilson's longtime touring band, including Scott Bennett, Paul Mertens, Darian Sahanaja, and Probyn Gregory also participated in the sessions, along with Matt Jardine, son of Al Jardine, and former bandmate Jeffrey Foskett. 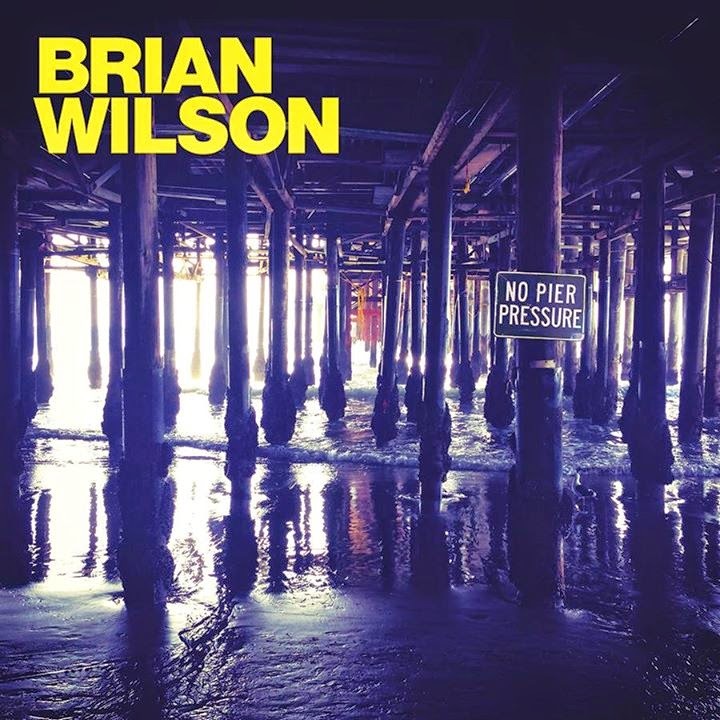 Brian Wilson has also achieved great solo success with 10of his own albums released to date, including his acclaimed 2004 completion of an album he first began recording in the '60s, Brian Wilson Presents... SMiLE, which reached Billboard's Top 20 and earned him his first GRAMMY® Award for a recording. Wilson won his second GRAMMY Award® for producing The Beach Boys' acclaimed 2011 release, The SMiLE Sessions. Wilson has also performed major, sold-out SMiLE and Pet Sounds tours in recent years with his own band. Wilson is a Kennedy Center Honors recipient, a Songwriters Hall of Fame inductee, and a UK Music Hall of Fame inductee. As a member of The Beach Boys, Wilson was inducted into the Rock and Roll Hall of Fame in 1988 and honored with The Recording Academy's Lifetime Achievement GRAMMY® Award in 2001. SANTA MONICA, Calif. (Jan. 28, 2015) — The 57th Annual GRAMMY Awards® continues its tradition of producing standout musical collaborations, universally known as "GRAMMY® Moments." This year's series of unique pairings includes current nominees Tony Bennett and Lady Gaga, a musical couple whose respective songbooks have entertained audiences for a combined 70-plus years; nominees Hozier and Annie Lennox; nominee Jessie J and vocal legend Tom Jones; and Maroon 5 frontman Adam Levine with singer/songwriter Gwen Stefani in a never-before-seen performance. They join previously announced performers AC/DC, Eric Church, Common with John Legend, Ariana Grande, Miranda Lambert, Madonna, Ed Sheeran, Sam Smith, Usher, and Pharrell Williams. Entertainment icon and two-time GRAMMY winner LL COOL J returns as host. Taking place at STAPLES Center in Los Angeles, Music's Biggest Night® will be broadcast live in high-definition TV and 5.1 surround sound on the CBS Television Network, Sunday, Feb. 8, 2015, from 8 – 11:30 p.m. (ET/PT). "Musical collaborations have become a GRAMMY staple, and the best part is that artists now suggest many of these duets themselves," said executive producer Ken Ehrlich of AEG Ehrlich Ventures. "I'm very excited about this year's special segments, and believe they'll be talked about for a long time to come." Sixteen-time GRAMMY winner and Recording Academy Lifetime Achievement Award recipient Tony Bennett and five-time GRAMMY winner Lady Gaga are nominated for Best Traditional Pop Vocal Album for Cheek To Cheek. Jessie J is up for Best Pop Duo/Group Performance for "Bang Bang" (with Ariana Grande & Nicki Minaj). Four-time GRAMMY winner Annie Lennox is nominated for Best Traditional Pop Vocal Album for Nostalgia. Established in 1957, The Recording Academy® is an organization of musicians, songwriters, producers, engineers and recording professionals that is dedicated to improving the cultural condition and quality of life for music and its makers. Internationally known for the GRAMMY Awards — the preeminent peer-recognized award for musical excellence and the most credible brand in music — The Recording Academy is responsible for groundbreaking professional development, cultural enrichment, advocacy, education and human services programs. The Academy continues to focus on its mission of recognizing musical excellence, advocating for the well-being of music makers and ensuring music remains an indelible part of our culture. For more information about The Academy, please visitwww.grammy.com. For breaking news and exclusive content, follow @TheGRAMMYs on Twitter, like "The GRAMMYs" on Facebook, and join The GRAMMYs' social communities on Google+, Instagram,Tumblr and YouTube. 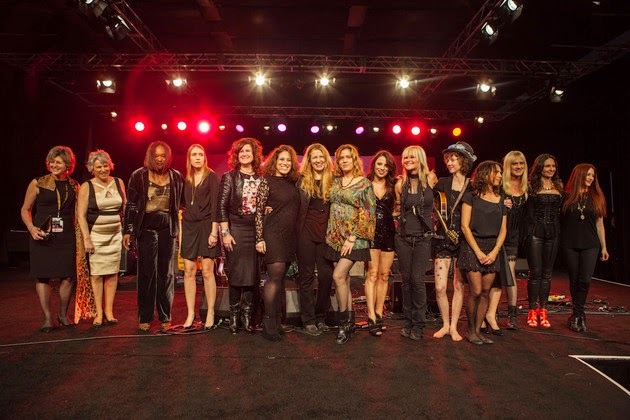 A who's who of music industry execs, celebrities, luminaries and supporters of women in music, gathered on Fri., Jan. 23 in the Anaheim Hilton hotel’s Pacific Ballroom to celebrate the 2015 She Rocks Awards, an event paying tribute to women who display leadership and stand out within the music industry. Named one of Billboard magazine's "7 must-see events at NAMM," the sold-out She Rocks Awards were held by parent organization the Women's International Music Network (the WiMN), and were co-hosted by WiMN Founder Laura B. Whitmore and guitarist, solo artist and 2013 She Rocks Awards winner Orianthi. 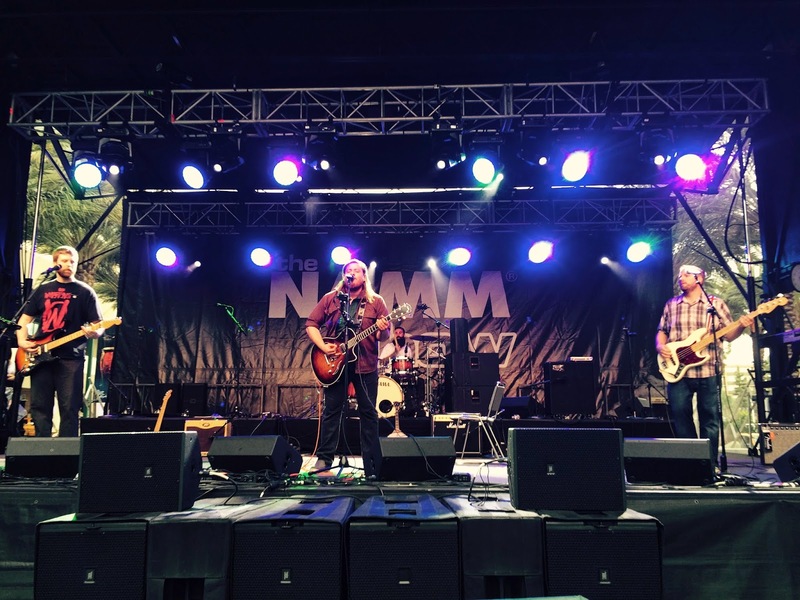 Now that I recovered a bit from the 40 or so hours I spent at the 2015 Winter NAMM Show (Jan. 21-25) in Anaheim, I want to look back at some of my favorite concert moments of the event. 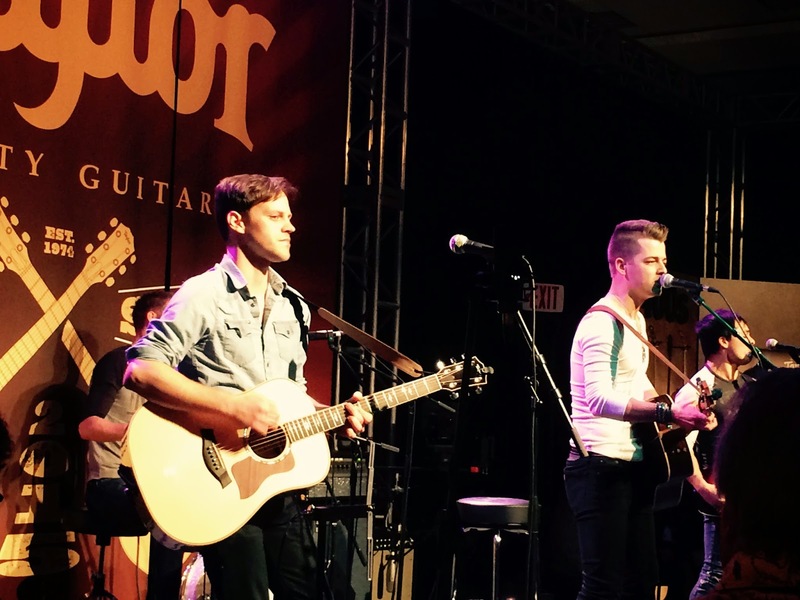 While waiting to cover the much-anticipated Peavey Electronics 50th Anniversary Concert at the Hilton, I decided to go check out rising young Nashville-based country artist Chase Bryant at Taylor Guitars. Although I wasn't there to specifically cover the show and didn't take notes, I was immediately impressed by Bryant's confidence as a performer as well as his strong vocals and fluid guitar playing throughout his 35-minute set. From the upbeat opener "Wayfarer Weather" (with its artful segue into Bryan Adams' "Run To You") and equally-infectious follow-up "Little Bit of You" to the tender ballad "Change Your Name" with its a cappella close, the 22-year-old Texas-spawned singer-guitarist is an artist to watch. I am looking forward to catching up on Bryant and listening to his self-titled 2014 Red Bow Records debut soon. Information: You can watch Bryant's performance at Taylor Guitars here. A number of musicians performed at the aforementioned Peavey event held at the Anaheim Hilton on Thursday night, but my single favorite performance was Blue Öyster Cult's opening set. Although the classic rockers performed a short four-song set, it was high on energy and boasted the band's most beloved rock classics. You can read my full review of the concert event on The Orange County Register site here. Vintage Trouble turned in my favorite single set of the long weekend, and based on the energy of the large audience crowded into Taylor Guitars, no surprise there. The Los Angeles quartet has impressed every time I have caught them live (including at both Coachella in 2013 and Doheny Blues Festival last year). The band's 36-minute set at NAMM was mostly acoustic, but boasted the energy of just about any other group's electric set. "It's Christmas for musicians," singer Ty Taylor said before the set in talking about the thrill of being at NAMM. "Merry Christmas everybody." Opening with "Lo and Behold," Vintage Trouble's R&B groove was the perfect sonic backdrop for Taylor's Sam Cooke-styled vocals. Even though he armed an acoustic guitar for the opener, master guitarist Nalle Colt unleashed the first of what would be a number of strong solos, this one with a definite blues feel. Another five involving and energetic tracks followed, with the infectious rock 'n' soul gem "Never Mind" (complete with attendees pumping their hands in the air), James Brown-minded "Strike Your Light" (with all four members positioned at the front of the stage, and Taylor ultimately wading into the crowd) and set-ending rocker "Blues Hand Me Down" thrilling those lucky enough to get into the intimate Taylor Guitars showcase. 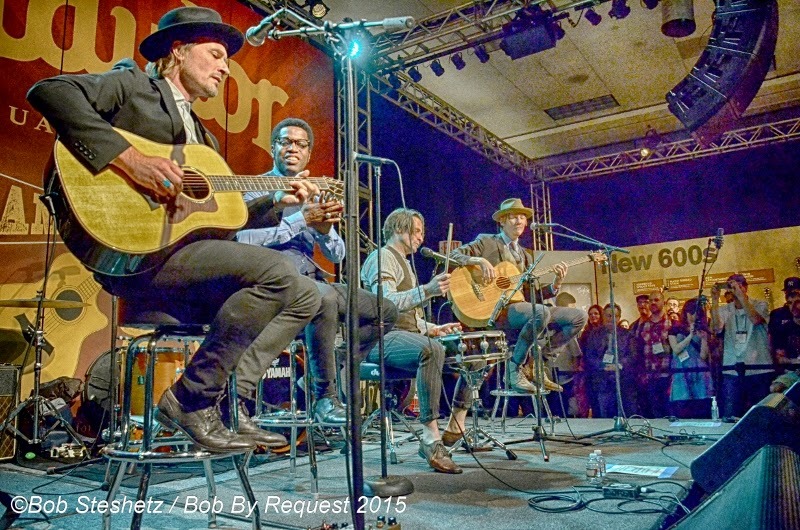 You can watch Vintage Trouble's amazing performance at Taylor Guitars here. It was all hosted by Sinbad. There was a wide range of musical styles showcased at the event, including folk, pop, rock, jazz and more. Highlights included Toto teaming with bassist Nathan East for a celebrative "Africa," Grammy Award winning singer-songwriter Colbie Caillat singing "Bubbly" and then sitting at a piano for an uplifting "Try" (the lead single from her most recent studio album Gypsy Heart). 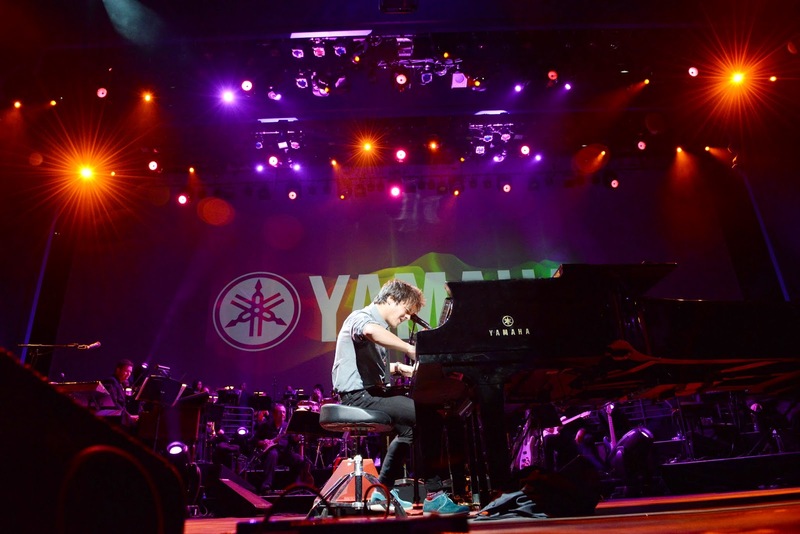 The highlight of the night came with Jamie Cullum's headlining performance, where he truly mixed up jazz, blue-eyed soul, jazz pop and other styles expertly. A skilled pianist, singer and dynamic showman, his "These Are the Days" and rousing "I Feel Fine" were the perfect way to introduce the British artist to many who undoubtedly were not familiar with him. Those who prefer a traditional approach likely loved his joining forces with smooth jazz pianist Bob James to perform Cole Porter's "Just One of Those Things." He ended his set with the swirling "Mixtape,' an indie pop song that morphed magically into a jazz piece in its instrumental section. A fantastic set to be sure. Hit Dog Hollar performing on the GoPro Stage at NAMM. I caught two noteworthy performances on Sunday afternoon. Moonville Collective was an eight-member band true to its name, playing thrilling bluegrass-styled Americana on the GoPro Stage for 40 fast-paced minutes. Following on the same large outdoor stage was San Diego-based rockers Hit Dog Hollar. The band somehow blended a heavy neo-grunge sound with blues and roots rock via winning rockers such as the Southern rock-styled "Battle of San Pasqual" and banjo-adorned "Barnstormers." The band closed with a Coachella-worthy "Chairman," which included hard rock and nuanced textures along the way.